This weekend has seen me visiting the Mothership. I phoned her up in the week and said 'I'd like to cook paella on Saturday night please?' 'Why?' asks the Mothership. 'For my blog. I've only ever eaten paella at La Tasca (more on this shortly) so I figured I'd make it for tea for everyone.' Cue confused silence. 'It's for my blog, the 366 recipe challenge. You know the one I explained to you when we came to stay in November and I asked you to let me make a pie so I could learn how to make decent shortcrust.' 'What challenge?' 'The one where I cook something new every day for a year. I'm four months in now.' 'Oh I don't have time to read about it. Who's doing this challenge?' 'Just me. I decided to challenge myself because it's not like I have anything better to occupy myself with' (said with a heavy hint of irony). Further bemused silence. I gave up trying to explain the challenge and justify myself. I then went for the angle of it being nice having someone else cook tea for a change and I think this appeased her slightly. So why, I hear you ask, have I only ever eaten paella in La Tasca? Well I've been to some amazing tapas restaurants in London; a favourite being the one in Spittalfields Market. But we spent so much time sampling all the different types of tapas that we never got round to a proper main course. 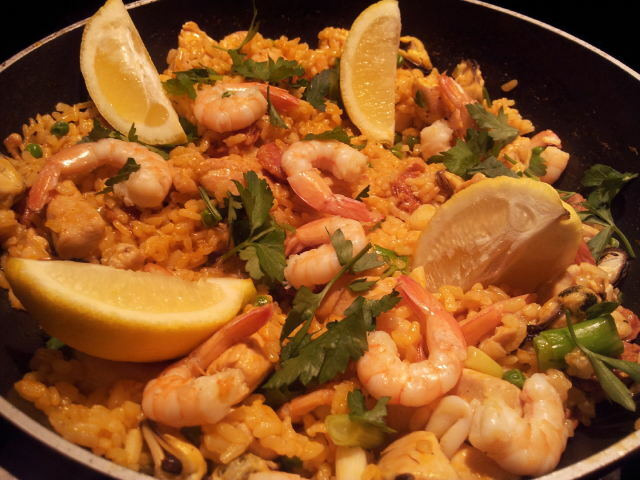 At weekends, visiting Borough or Camden markets, I saw some amazing paella on offer by street vendors. But when you're accompanied by someone who is 'discerning' in what he eats there was no chance of eating something so amazing. And the one day I managed to get to Southwark Cathedral by myself on a half-day from work; they guy with the paella wasn't there. Ever since then I've been meaning to try making it myself but life just got in the way. Until today. After perusing several different interpretations, I went for Lorraine Pascale's recipe from Home Cooking Made Easy. I've enjoyed several meals from this book since I got it for Christmas and felt it was as good a place to start as any. It seemed pretty simple and one of the plus points for me was that it didn't have mussels in it. Don't get me wrong. I love mussels. They just don't love me. I've eaten them five or six times in my life and every single time, I've ended up acquainting myself with the bathroom ceramics. Once or twice would be unlucky. This many times leads me to believe that I possibly have some weird allergy. Of course, despite knowing this, on the way out this morning, my mother piped up with 'Oh I'm really looking forward to having mussels in the paella tonight'. Cue inward groans from me. Sadly, I couldn't find any fresh ones in shell for that characteristic look, so I settled for some fresh, mixed seafood (prawns, squid, mussels) and some tail on king prawns. I was also suprised that this recipe uses chicken breast as I believe the more traditional recipes use whole chicken thighs. But not wanting to do anything too removed from the recipe, I did as instructed. The overall result was pleasing. I used white Merlot instead of sherry. I wish there had been more direction on the measurement of smoked paprika because I personally felt it could've done with some more. A small test bit tasted okay, but a whole bowlful tasted nice, but slightly lacking. If (or when) I make it again, I'd use double the chorizo, more squid and if I was making it for other people, I'd use shell-on mussels. I might also throw in some thinly sliced red and green pepper too. Not sure how authentic that is. I also found that I needed to add about another 200ml stock as after five minutes, all the liquid had been absorbed. But that may just be the rice that I had. Best of all was that for once, everyone had the same thing for dinner. Well except for Miss A who had hers avec jus d'orange (food stirred into her juice cup before consumption!) There were no sulky faces and much to my dismay, everyone wanted seconds - I was hoping to polish off the rest myself! Season with salt and pepper and stir through, then leave, don’t worry if some of the rice sticks to the pan, the Spanish appreciate this ‘Socorrat’ as the best bit!